What do demodex mites have to do with rosacea? 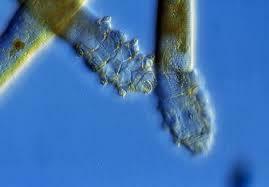 Demodex mites are usually on all adults and what they are doing there is up for debate since no one really knows. Some conjecture a symbiotic relationship but so far has not been discovered. Demodex do not appear on babies but show up later in life. Demodex feed on sebum and hang around hair follicles. They like warmth so they usually are on the face. They do not like light so they bury themselves deep into the skin during the day and come out at night and move around. They have no way to eliminate their waste and eventually die. This poses no problem for most humans who haven't a clue these demodex are on their face. The history of demodex is that there are only two kinds that appear on humans even though there are dozens of kinds and their connection to acne rosacea goes way back and has been debated by the medical authorities for over a hundred years. In rosacea patients the number of demodex are greater than in the average population who do not suffer from rosacea. Demodex density counts are one way to quantify. Recent studies confirm that a bacteria in the mites (Bacillus oleronius, Staphylococcus epidermidis, Bartonella quintana, Bacillus pumilus or Bacillus cereus) may have the clue to why rosacea appears. Whether the mites cause the rosacea or the rosacea increases the mite density count is a chicken or egg question. Most studies conclude that a higher demodex density count appears on humans who have rosacea. Treatment for demodectic rosacea, a variant of rosacea, is one way to confirm the diagnosis of demodectic rosacea. Not all cases of rosacea are demodectic. Dermatologists have been treating recently with Soolantra. We now have all the demodex posts in one category. A growing list of different types of bacteria is associated with these mites and rosacea. Demodectic Rosacea is a variant of rosacea. What is the difference between demodex and bed bugs?